siendo Presidente de la República. lived as President of the Republic. Erected 1955 by Dirección de Monumentos Coloniales. Location. 19° 26.033′ N, 99° 8.334′ W. Marker is in Ciudad de Mexico, Ciudad de México. Marker is on Avenida Francisco I. Madero just west of Calle Bolívar, on the right when traveling west. Touch for map. The INAH Mediateca notes that this marker was initially at Madero 18, one lot to the west. Marker is at or near this postal address: Avenida Francisco I. Madero 20, Ciudad de Mexico, Ciudad de México 06000, Mexico. Touch for directions. 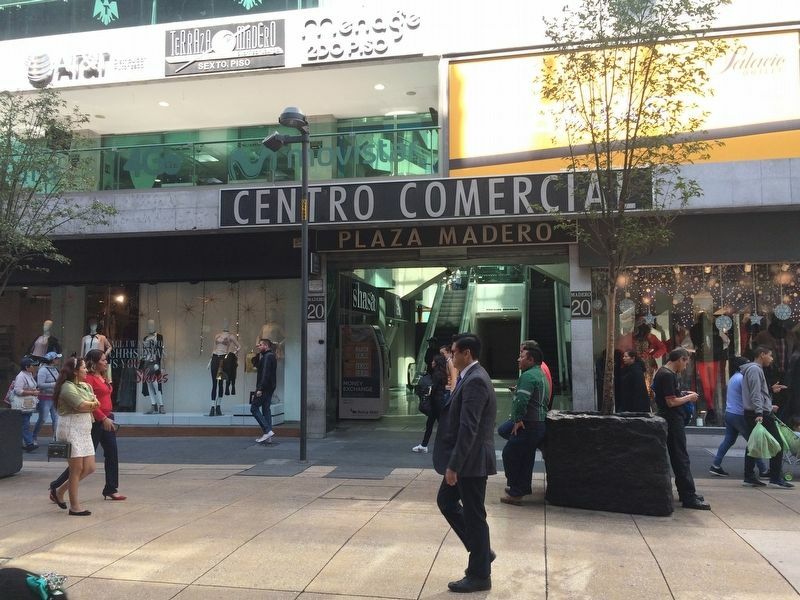 The marker is to the left of the entrance to the Centro Comercial Plaza Madero at 20 Avenida Francisco I. Madero. 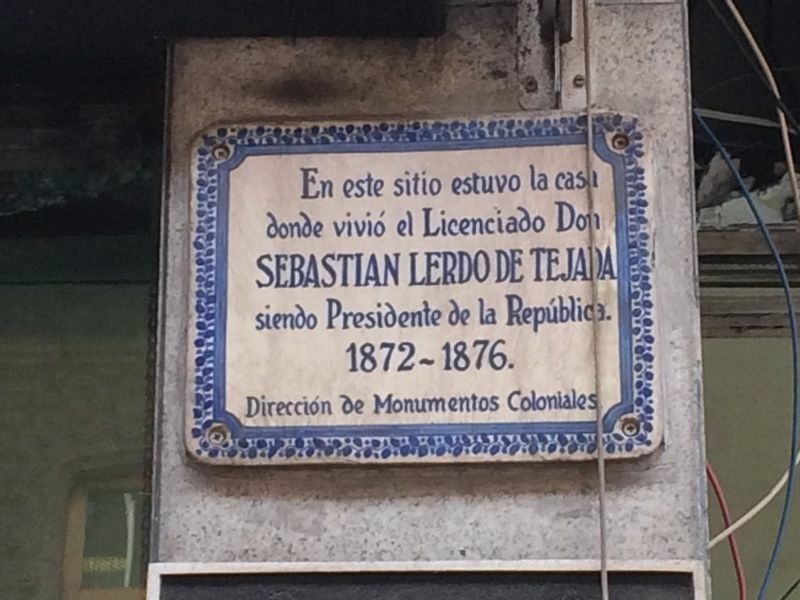 (a few steps from this marker); Gante Building (within shouting distance of this marker); José de la Borda (within shouting distance of this marker); Teatro Santa Anna (about 90 meters away, measured in a direct line); House of José de la Borda (about 90 meters away); The Expiatory Temple of San Felipe de Jesús (about 90 meters away); Holy Trinity Methodist Church (about 90 meters away). Touch for a list and map of all markers in Ciudad de Mexico. 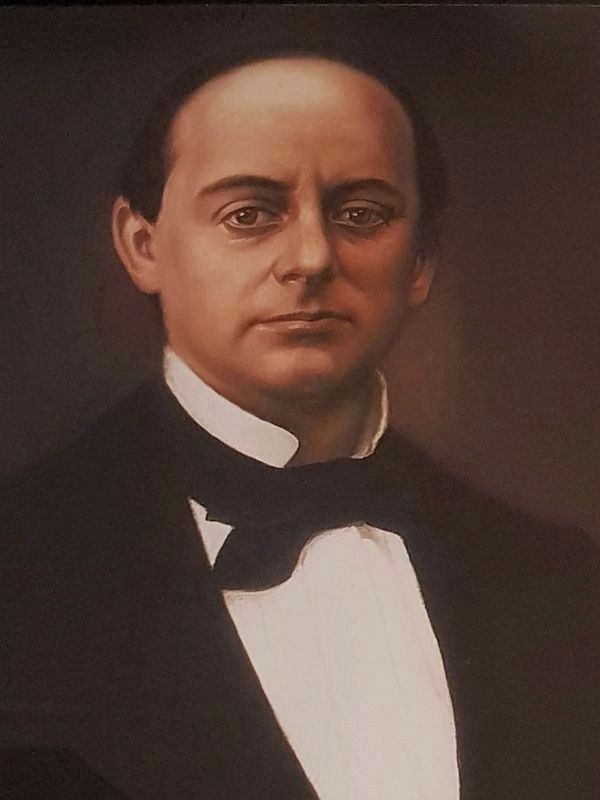 This reproduction of a portrait of Lerdo de Tejada is from the Museo Magia del Pasado (Magic of the Past Museum) at the Cerro de las Campanas, Querétaro. (Author and date unknown). The notes about the marker mention that it was originally at Madero 18, which is one lot down from its current location at Madero 20. More. 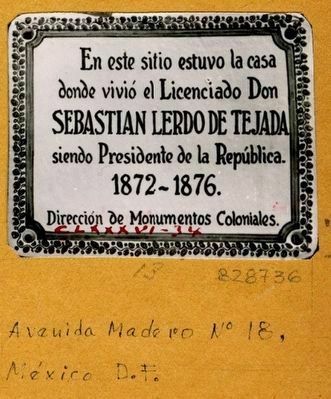 Search the internet for Sebastián Lerdo de Tejada. Credits. This page was last revised on April 13, 2019. This page originally submitted on December 12, 2017, by J. Makali Bruton of Querétaro, Mexico. This page has been viewed 82 times since then and 9 times this year. Photos: 1, 2. submitted on December 12, 2017, by J. Makali Bruton of Querétaro, Mexico. 3. submitted on April 13, 2019, by J. Makali Bruton of Querétaro, Mexico. 4. submitted on August 16, 2018, by J. Makali Bruton of Querétaro, Mexico.